Concept mapping is a technique for representing knowledge in graphs. Nodes represent concepts and links represent the relations between concepts. To do a Map, write the main idea in the centre of the page - it may be a word, a phrase, or a couple of juxtaposed ideas, then place related ideas on branches that radiate from this central idea using the built-in concept map symbols. 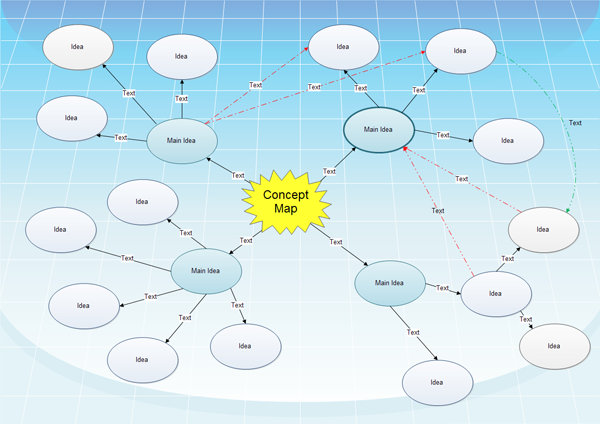 Click here to download Concept Map Freeware. Concept Mapping may be seen as a type of brainstorming. Both Mapping and brainstorming may be used to encourage the generation of new material, such as different interpretations and viewpoints. However, Mapping relies less on intentionally random input, whereas, during brainstorming, one may try to think up wild, zany, off-the-wall ideas and connections. Brainstorming attempts to encourage highly divergent "lateral" thinking, whereas Mapping, by its structure, provides opportunity for convergent thinking, fitting ideas together, as well as thinking up new ideas, since it requires all ideas to be connected to the centre, and possibly to one another. Paradoxically, the results of brainstorming usually appear on paper as lists or grids -- both unavoidably linear structures: top to bottom, left to right. Mapping is less constrictive -- no idea takes precedence arbitrarily (by being at the "top" of the list). It clearly defines the central idea, by positioning it in the centre of the page. It allows you to indicate clearly the relative importance of each idea. It allows you to figure out the links among the key ideas more easily. This is particularly important for creative work such as essay writing. It allows you to see all your basic information on one page. As a result of the above, and because each Map will look different, it makes recall and review more efficient. It allows you to add in new information without messy scratching out or squeezing in. It makes it easier for you to see information in different ways, from different viewpoints, because it does not lock it into specific positions. It allows you to see complex relationships among ideas, such as self-perpetuating systems with feedback loops, rather than forcing you to fit non-linear relationships to linear formats, before you have finished thinking about them. It allows you to see contradictions, paradoxes, and gaps in the material -- or in your own interpretation of it -- more easily, and in this way provides a foundation for questioning, which in turn encourages discovery and creativity. 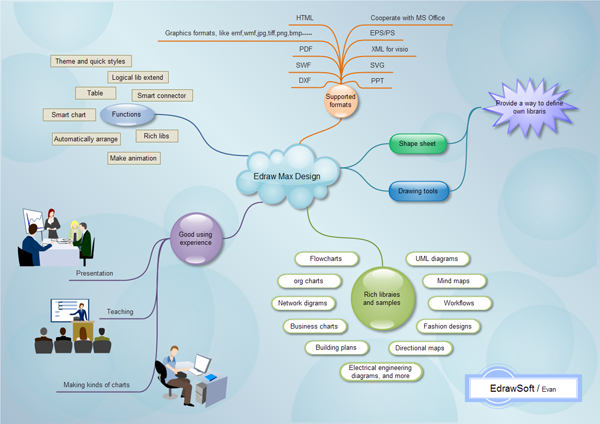 Mind Map is a popular related technique, invented (and copyrighted) by Tony Buzan in the UK. He describes mind maps as: " a mind map consists of a central word or concept, around the central word you draw the 5 to 10 main ideas that relate to that word. You then take each of those child words and again draw the 5 to 10 main ideas that relate to each of those words. " The difference between concept maps and mind maps is that a mind map has only one main concept, while a concept map may have several. This comes down to the point that a mind map can be represented as a tree, while a concept map may need a network representation.